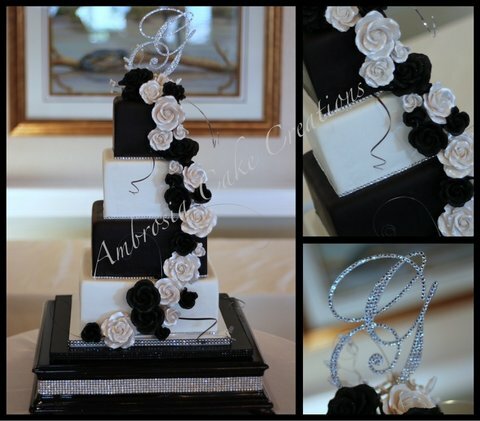 I have waited all year to create this black and white themed wedding cake. Iced with black and white fondant and embellished with black and white roses were made of gum paste with added pearl coloring and some non toxic sparkle. The monogram topper made of crystal as well as the border of the wedding cake. We traveled to Bald Head Island Resort which was an added fun experience. Some of the other vendors that were part of this beautiful wedding event are Sarah Layton and Samantha Dockery from Bliss By Sam Weddings and Occasions, Hipshack Band, Videographer Reel Weddings, Chris Lang Photography .